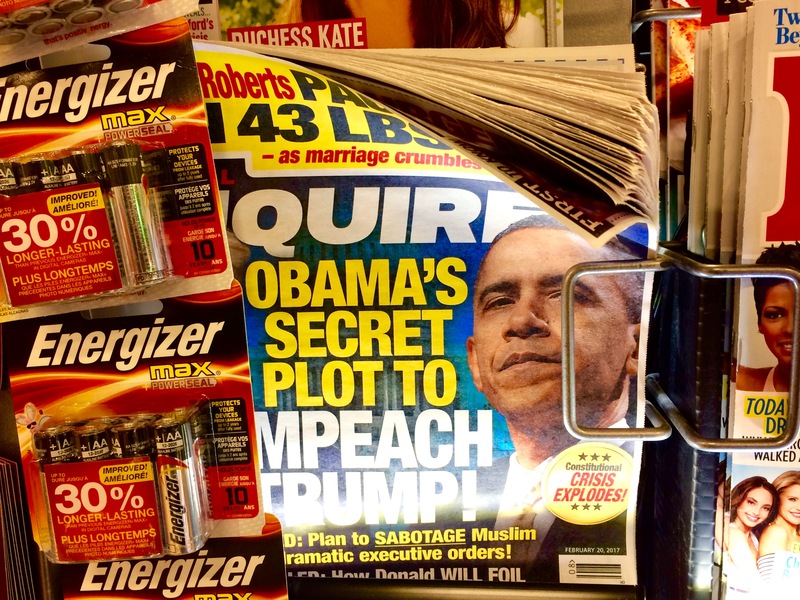 As I waited in the supermarket checkout lane the other day and took in the tabloid headlines, it occurred to me that fake news isn’t new at all. We’ve been inundated with it for decades. However, given our recent election, it appears that what’s new is that more and more of us are beginning to believe it. I grew up in the 60s and 70s. Many called it the age of skepticism, and given the era we had every right to not accept at face value everything we read, heard and were told. In high school “Skeptic” magazine supplemented my History classes and Social Studies discussions. We were taught how to read between the lines, look for bias, and understand how context and events shape points of view. Somewhere along the way our skepticism has devolved into a willingness to believe. How in the world did this happen? Cable changed the game fast. It was no longer the rural, community message board. CNN was born. HBO was born. MTV was born. Communications concepts that could never have happened on network TV were thriving on cable. People flocked to them and so did advertisers, but with cable programming the whole idea of broadcast narrowed a bit. What was once mass messaging was becoming targeted to the specific demographics and market segments that cable networks served up to advertisers. Values and life styles mattered. The voice of the consumer mattered. “King Customer” was born. Little did I know then, but the stage had been set. Fast forward to the internet. Lots and lots and lots more channels. Something for absolutely everybody, but our collective, shared experience of media had changed. It had become fragmented and highly individualized. Those days when almost every American could tell you what somebody like Walter Cronkite had to say were long gone. Fast forward to Google. My search results differ from yours because they’re based on my personal search history. I am being cocooned, and so are you. The content I find and ask to have delivered to me no longer shapes my beliefs, it merely validates and reinforces them. Fast forward to Social Media. Everybody has become their own personal network. We constantly broadcast our opinions, which are reinforced by what we find in our media cocoon to support them. We are getting angrier with those who don’t agree with us. We can’t understand how they could have possibly come to the opinions they have. We cut them off. We unfriend them. We are a nation divided. Know the attitudes and behaviors of the people you want to reach. Then tailor your messages to what those people are willing and wanting to believe. My belief is that given where media and marketing are moving, there is a fundamental question that all marketers and consumers should be asking in times like these.